- PINE RIDGE, S.D. - Natalie Lame's two-bedroom home is small and run-down, but adequate for the 26-year-old woman and her two children. other relatives and family friends. If only they had it to themselves. Her sister and brother-in-law and their daughter live with her. So does a friend and her three children. Consequently, the house looks like what it essentially is: an emergency shelter, with mattresses on the floor in every room but the kitchen, and people sacked out on the sofas, too. Lame lives on the Pine Ridge Indian Reservation, where her situation is far from unusual. All around Indian country, families are doubling, tripling, even quadrupling up because there just aren't enough houses to go around. Nationally, nearly a third of the homes in Indian country are overcrowded, according to 1990 census figures, the most recent available on the topic. That was more than six times the national average. And Raven Miller, spokeswoman for the National American Indian Housing Council, says the situation "is still continuing. Maybe in 20 years we'll be able to document an improvement." About 220,000 new homes are needed in the 314 tribal areas around the country for a population that numbers only 2.5 million nationwide, with just under half those people living on reservations, according to the housing council. Congress budgeted $648 million for Indian housing this year, far short of the $1 billion requested, said the council's executive director, Gary Gordon. "It's frustrating in that we see there's certainly a significant need out there," he said. The problem is most acute on rural reservations such as Pine Ridge, in the southwestern corner of South Dakota, where the number of people who are technically homeless mirrors the national statistics for Indian country. But that doesn't mean a third of the reservation's roughly 40,000 residents are sleeping in the muddy streets of its far-flung villages. "It's a different kind of homelessness," said John Yellow Bird Steele, president of the Oglala Lakota tribe, whose members live on Pine Ridge. Here, just because someone doesn't own or rent a home doesn't mean he has nowhere to live. "Our tradition and culture tells us to watch out for one another," said Ernie Little, executive director of Oglala Sioux Lakota Housing, the reservation's housing agency. Steele, the tribe's president, shares his home in Manderson, about 18 miles from the tribal offices in the town of Pine Ridge, with his daughter and son-in-law and their seven children, his sister's six children, and two other relatives. "We'd need three homes for everyone," he said. But getting homes built on rural reservations, which lack both infrastructure such as sewer systems to support them and people with jobs to buy or rent them, is a struggle. Nearly three-quarters of Pine Ridge's adults are unemployed. Shannon County, which encompasses the reservation, consistently ranks among the nation's five poorest. Most of the reservation's homes are low-cost rental units. People pay between $75 and $150 monthly to live there. Given the condition of many of those homes, that's hardly a bargain. 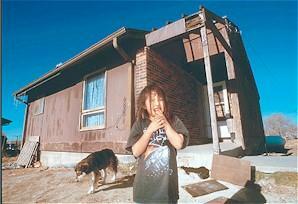 The Indian Health Service rated 69 percent of reservation homes as substandard in 1997. One home in five lacks complete plumbing, and nearly that many are without complete kitchens - something that 99 percent of the rest of the homes in the country have, according to the census. In 1990, the census found that 34 percent of reservation homes burned wood for heat. A Census Bureau statistical brief notes - with exclamation points - that similar levels of inadequate housing haven't existed nationwide since the 1950s. "I grew up in that environment. We lived by lamplight and heated with wood," Little said. Lame still lives in the 30-year- old home in which she grew up. It sits on a dirt lot in a small development just south of Pine Ridge. Gang graffiti is scrawled on nearby homes, most of which - like Lame's - have seen better days. The roof leaks, as does the shower in the home's only bathroom. Part of the kitchen counter has rotted away, exposing the pipes beneath the sink. Much of the linoleum is peeling, laying bare the splintered floorboards. Lame and her younger daughter, Shelbi, 5, share a double-bed mattress on the floor of one bedroom; her older girl, Shi-Dawn, 6, and her niece share the other bedroom. Her friend and her friend's three children take over the sofas and a mattress on the living room floor, and Lame's sister and her children sleep in the basement. Which, when it rains, also leaks. "At least we all have places to sleep," Lame said. "We manage." A couple of blocks away, Mike and Mary Poor Bear are also managing. They've added three makeshift basement bedrooms to their three-bedroom house to accommodate the 16 people living there. Three of their 14 children - along with their own children - live at home. One daughter and her six children moved home in October after she and her husband separated. And their 18-year-old son, Isaiah, is staying there with his pregnant girlfriend, Morning Star Hill, and their 15-month-old son, Darien, while the young couple tries to find jobs and to qualify for a reduced- rent apartment in Rapid City, 110 miles away. "Everyone we know is like this," said Mary Poor Bear, 53. Her dream, she said, is a home just for herself and her husband, "maybe a double-wide out in the country." It probably will be awhile before the Poor Bears realize that dream. Pine Ridge is getting federal funds to build 45 new homes this year. That's big news here, where the last federal grant for homes came in 1999, and then for only 18 houses, said Little. Problem is, he said, the tribe needs about 3,000 more homes. But even those few represent an improvement, said Gordon of the Indian housing council. "When I get invited to a ribbon-cutting, it's so satisfying to see all these people with great big smiles beaming across their faces as they're moving into a new home," he said. American Indians are, on average, younger than the general population, and their numbers are increasing more rapidly, further straining housing resources. "Half of our population are kids, and every year more of them are starting families," said Steele. At the housing authority, there are 600 families on the waiting list for affordable housing, some of whom have been waiting for more than a decade. "The irony is that in the beginning, when (the federal government) made the reservations, our ancestors didn't want to stay here," said James Franco, a tenant services representative for the housing authority. "Now, people want to stay here, but there's nowhere for them to live."